A former officer makes a case for carrying what cops carry. While any handgun can be used for self-defense, some are clearly better than others because of their caliber, capacity, method of operation and quality of construction. One type of handgun that is familiar to everyone is the so-called service pistol. This term refers to sidearms carried by law enforcement officers. 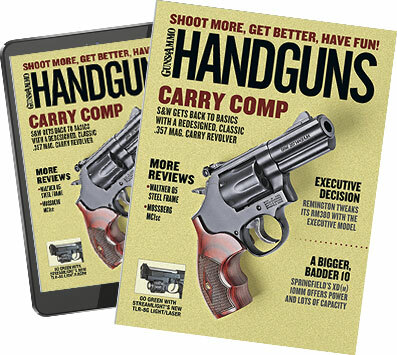 These handguns have a solid reputation for reliability and serviceability and are almost always good choices for citizens who are licensed for concealed carry. Civilians looking for a pistol that has been widely accepted by the law enforcement profession often choose a Glock. Shown is a Glock 17. Police sidearms are usually inherently accurate in trained hands because they are manufactured with tremendous precision and the finest materials. They are also generally very ergonomic and fit a variety of hand sizes, especially those models that accept interchangeable grips. Modern-day "cop guns" are generally constructed to withstand the elements and are available with very effective night sights. Many manufacturers today offer pistols with an accessory rail designed to hold a small flashlight. I believe money is no object when it comes to selecting a firearm for personal protection or home defense. I felt the same way during my law enforcement career when I carried various high-quality, name-brand personal defense weapons both on and off duty. My recommendation is that you purchase the best law enforcement-style handgun that you can afford. One option is to buy a pre-owned law enforcement-style handgun in serviceable condition. Well-made, quality firearms generally don't wear out after a few years of service. Used law enforcement handguns that have been factory refurbished are also available for sale to the general public. Members of the U.S. Coast Guard, including the elite Special Agents of the Coast Guard Criminal Investigative Service, recently adopted the SIG 229 DAK in .40 S&W as their DHS service-issued Personal Protection Weapon. While there is nothing that prevents you from using a Ruger Blackhawk or Colt Single Action Army for personal protection or home defense, you will probably wish you were armed with something more modern if you find yourself in a situation that may require you to use deadly force. It pays to use a gun with which you can deliver excellent shot placement while operating it under stress. Remember, just like a police officer, you are personally accountable for every shot fired in a self-defense situation. And despite the advancements in semiauto-pistol technology, there is nothing wrong with being armed with a double-action revolver, which is not commonly carried by police officers today. This is especially true if it is chambered in a substantial caliber. If you choose a revolver, my advice is to use speedloaders and practice combat reloading techniques with these devices. It has been said that civilians who use the same guns as law enforcement officers have some advantage when they defend their actions in court. Generally speaking, police firearms are not "tricked out" or modified in any way that might make a jury believe the owner was out looking for trouble. There is also something to be said for adopting the position that if a particular handgun is good enough to protect the citizens of your community, it's good enough to protect you and your family. Before you purchase a cop gun, you should take into consideration that police officers often are required to carry certain handguns in prescribed calibers while on and off duty. Legally armed civilians should try and ascertain the reasons why a law enforcement agency issues a particular handgun. For example, if an agency switched firearms because of reliability problems, you wouldn't want to buy the model that had problems. Keep in mind, too, that some law enforcement agencies like to be "progressive." This means that a new handgun or caliber might be adopted even though there was absolutely nothing wrong with the firearm previously authorized. The 9mm S&W 6906 was once a widely issued service pistol for police officers. Pre-owned law enforcement pistols in serviceable condition are generally very reasonably priced and make excellent weapons for legally armed civilians. A good way to determine how law enforcement officers feel about their issued handgun is to ask them if they would purchase the same make, model and caliber for personal use. Some officers may recommend their issued firearm but not in the caliber or the particular model variation they are issued. You should ask if the issue gun is flawlessly reliable. Many law enforcement agencies require their personnel to use factory-manufactured hollowpoint "service" ammunition when they qualify. This makes a great deal of sense because you should train (to some extent) with the ammunition that you intend to use in your personal defense weapon. You can get different results if you practice with less potent FMJ ammunition and use higher-velocity ammunition for personal protection. Of course, you should always test-fire your firearms with the ammunition you use for self-defense to make sure the guns function reliably. hoices for personal protection and home defense. Shown is an S&W .45 ACP Model 625 revolver with a three-inch barrel. Firearms training and knowledge of the law are just as important for a legally armed citizen as they are for law enforcement officers. By the time the average rookie cop or federal agent graduates from a basic-training academy, he has probably fired 2,000 rounds of ammunition and qualified on a judgment course and a timed course of fire. When was the last time you were tested under pressure and fired that many rounds? My definition of a good handgun is one that is flawlessly reliable, extremely accurate and easy to reload, disassemble and maintain. A good handgun must also be able to fire a projectile that is capable of delivering effective stopping power. If every handgun you use for self-defense has these qualities, you should consider yourself well armed. Remember, ensuring your personal protection is a package deal that includes the right firearm and ammunition, receiving some meaningful training, practicing as often as possible and observing the law. Editor's note: The author is a retired U.S. Customs Agent and former New York police officer.